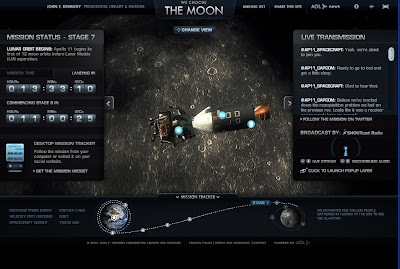 The website for We Choose the Moon dramatizes the lunar landing that first took place forty years ago with 3-D animation that can be oriented from several perspectives and a representation of the crackling audio feed from the communicative channel of sound. On the linked Twitter feeds for the Apollo 11 Spacecraft and Houston Control, space enthusiasts can re-experience the exchanges between the space ship and engineers on the ground in a recreation of the real-time discussion between NASA participants. As institutional rhetoric, it is interesting to note the ties between this project and the John F. Kennedy Presidential Museum. In contrast, Flash user communities may be attracted to the site only because it was recognized by an industry standard, the FWA: Favourite Website Awards. At the same time, sites from commercial sources such as this "three-camera" website from Louis Vuitton present the testimony of witnesses from various NASA projects, such as Sally Ride, Jim Lovell, and even Buzz Aldrin himself with the imprimatur of a luxury brand.